She knows perhaps better than anyone: lines drawn between ethnicities are easily emphasised by language. The words with which we communicate, the titles by which we identify, the languages in which we are educated – each of these have an impact on not just our own lives, but also the lives of those around us. Many residents in the town of Tetovo have experienced this first-hand. Set about 45 kilometres west of its country’s capital of Skopje, Tetovo is home to just shy of 75,000 residents and host to one of the largest Albanian communities in the Republic of Macedonia. In fact, it is often regarded as the unofficial capital of its largely Albanian-populated region. Its proximity to the border of Kosovo, a disputed territory to the north with a majority population of Albanians, is perhaps one of the reasons for the continued fits of direct violence and political tension between ethnic Macedonians and Albanians sharing the area. While the Republic of Macedonia has fared well in terms of inter-ethnic dispute when compared to neighbouring countries in the area, the north-western region that houses Tetovo continues to witness a deep distrust and even violence between the Macedonians and Albanians. This is fuelled by an education system that often divides students from one another based on ethnicity, which results in higher rates of youth contention than is found in many other parts of the country. In fact, teachers often conduct classes in completely different languages, only serving to further isolate youth from these two backgrounds that are so often set in opposition to one another. Recognising this, Frosina began to develop a passion for contributing to her community and making a positive impact between Albanians and Macedonians from a very young age. Students participate together in GFP programming in the Republic of Macedonia, where ethnic Albanian and Macedonian youth often struggle to interact peacefully. Given the conflicts and even the nature of her secondary education, which hinged largely on language, it might seem less out-of-place for Frosina’s parents to have encouraged her to pursue a degree in translation instead of her first choice, Social Work and Social Politics. However, before even completing her studies, Frosina’s desire to see unity between ethnic Albanians and Macedonians took over yet again. 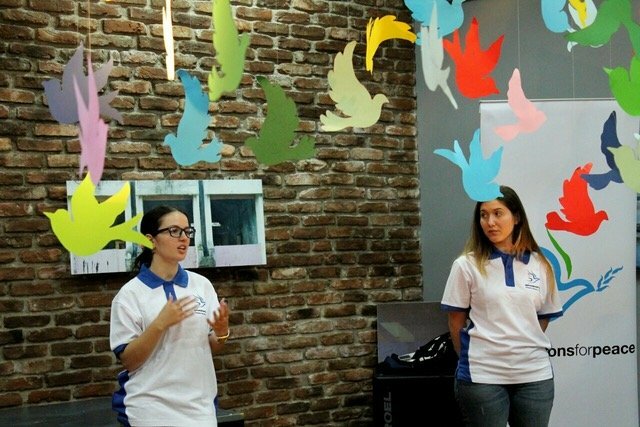 Despite her path toward a career as an interpreter, Frosina decided to translate her passion for social politics into volunteer work, joining Generations For Peace (GFP) with her sister, Angela, in 2012. 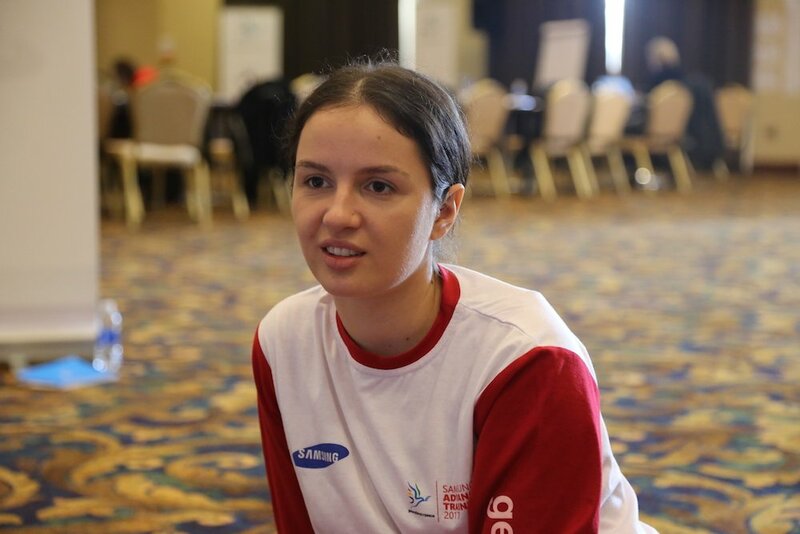 “When I first began my volunteering, I never thought that I would be volunteering for so long,” Frosina shares, looking back over her five years with the NGO and recalling how she had always been scared of working with children – a daunting challenge to overcome when joining a youth-led, youth-focused organisation like GFP. Frosina also never thought that her work as a volunteer would lead her to uncover her greatest passion – in fact, the only thing more surprising than the journey to the discovery was the discovery, itself. Through volunteering, Frosina had revealed her unlikely love of teaching. In the course of the almost six years she has been with the organisation, Frosina’s experience in schools and communities around Skopje and Tetovo has redirected her focus, pinpointing youth and children as her drive rather than her fear. Over this time, she has helped them promote unity and build peace in the region. Her initial fear in working with children has transformed into her inspiration for fulfilling her dream of promoting social causes and bring peace. Macedonian and Albanian students using art to build peace. With a deep love of art, Frosina commits herself largely to GFP’s Arts For Peace Programmes in the Republic of Macedonia. She shares about her favourite memories working with the children in her community and in the programme: the first shadow puppet show they ever produced together, the first paper birds exhibition, feedback from the parents of the children she worked with that emphasised the impact they have had, the openness of the children in describing personal abuse, the feeling of safety in Sport- and Arts For Peace sessions despite the ethnic mixture of students and youth that had for so long been conflict-inducing and, unfortunately, remains so elsewhere in the region. “I also remember the first time the kids asked me for advice,” Frosina comments. There is something different about this memory for Frosina. Something salient and powerful that has struck a chord in her more deeply than all the others. Something surprising and unexpected for a woman who at first experienced intense fear at even the thought of working with children. Something that has shaped Frosina more than she could ever have hoped or anticipated. Frosina (left) leads a GFP session for students surrounded by their art projects.